Firstly mix all the marinade together in a deep tray or dish and then add the chicken turn cover to coat in the marinade and then leave, covered in the fridge for as long as possible (up to 24hrs) and for a minimum of an hour. Peel and cut the carrots into very thin strips, and add to a large mixing bowl. Then cut the spring onions thinly on a sharp diagonal and also add to the bowl. Cut the Chinese cabbage down the middle, de core, slice to add to the mix and finally de-seed the cucumber, slice thinly and add too. For the dressing, simply mix all the ingredients together and set aside. When you are ready to eat, heat up a grill to very hot (or if you are barbecuing make sure it is hot and ready). Take the chicken out of the marinade and then place on a grill tray and cook for 8 minutes each side until cooked throughout and caramelised. Then add the dressing to the salad, mix well and serve a big pile of salad with the chicken on top. 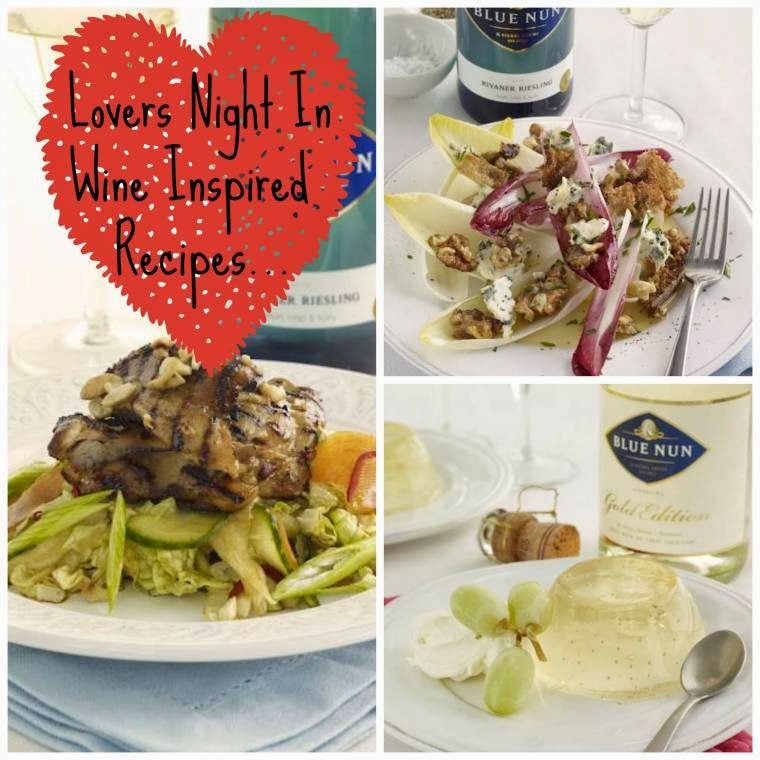 “The Rivaner Riesling is really is a super match for most types of Asian and oriental style dishes, which I find can be really hard to match a wine with and a glug of this fresh, fruity wine is great in the marinade too”. “There is a big trend for lower alcohol drinks at the moment, but some that I’ve tried are rather watery. 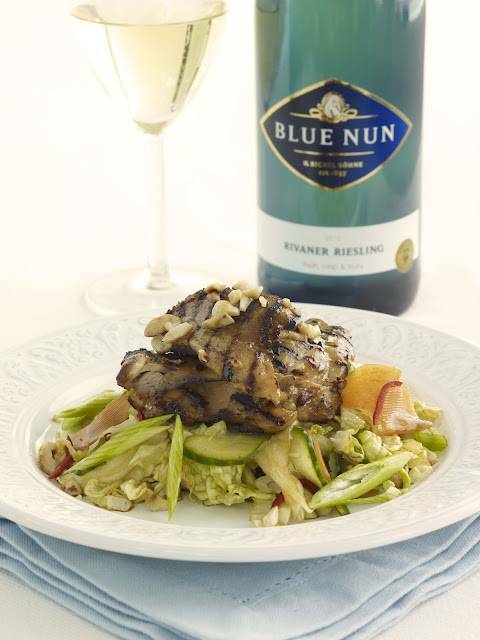 However, the Blue Nun Delicate drinks (5.5% alc) however are packed with flavour and taste. They’re ideal for the lazy summer days, picnics and bbq’s, or to serve as an aperitif when you want something refreshing & light to serve to guests. They’re made with full bodied, aromatic wine and delicious fruit flavours such as white peach, mango, raspberry and lychee, which taste delicious”. Firstly cut the sourdough slices, into rough largish cubes, drizzle with olive oil and then grill until crisp and golden. Then add the walnuts and sugar to a small frying pan, and fry until golden brown and caramelised. Cool both the croutes and the walnuts. Then mix all the dressing ingredients together and crumble/cube the blue cheese. When you are ready to eat mix the leaves, with the croutes, dressing, cheese and walnuts then serve. Firstly take the grapes and cut into little branches with 3 grapes per set, then place on a tray and pop in the freezer. Soak the gelatine sheets in a small bowl of cold water for about 5 minutes until softened. 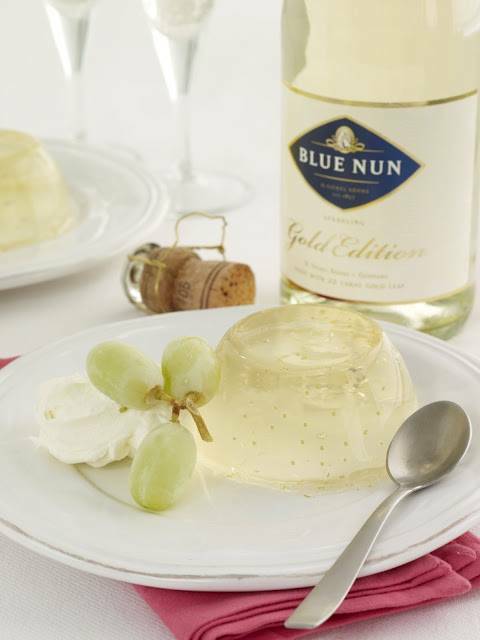 Meanwhile, put 100ml of the Blue Nun Sparkling Gold and the sugar into a small saucepan and bring to the boil. Squeeze the gelatine sheets to remove any excess water and stir into the wine mixture until dissolved. Then mix the heated wine mix in with the rest of the wine (500ml), add the elderflower cordial and pour into a large bowl and place into the fridge. Leave for at least an hour then check and stir. Basically you keep doing this until the mix has thickened enough for the gold flakes to not sink to the bottom. When ready pour into four individual metal pudding moulds, about 200ml/7fl oz/generous 3⁄4 cup capacity, if you want to turn the panna cottas out onto dessert plates, or into four pretty serving bowls. Put in the fridge to set for at least 2 more hours, or overnight. Then pour the cream and icing sugar into a bowl and whip until soft peaks. If the panna cottas are in metal moulds, pour boiling water into a bowl and quickly dip the moulds into the water before turning them upside down on to dessert plates. Then add a dollop of cream and some of the frozen grapes. 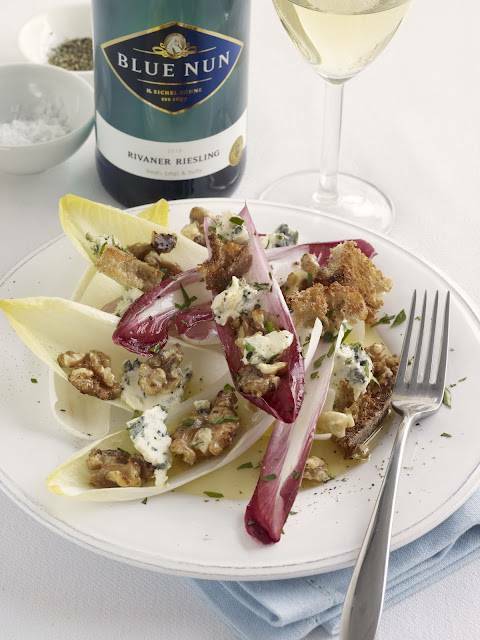 Serve with a glass of sparkling gold! "21/09 Link Up Your Favourite Posts This Week : Welcome To The Weekend Hop…"